The premise of One Order of Ministry has the potential to enrich the church. I agree that a thorough discussion of the issues will expand our understanding and knowledge of the interplay among the three forms of ministry under question. The document suggests that One Order makes room for all forms of ministry. I want that to be true, but is it? The term ‘ordered ministers’ continues to confuse congregations, and a hierarchical pattern still exists. I would caution that the ‘diakonia’ has appeared and disappeared, been defined and redefined, named and renamed, included and excluded many times throughout the history of the Church. I do not want our church to lose this vital ministry. It is more important now than ever before because people no longer gravitate toward a church during major life events such as trauma, sickness, major transitions, poverty or homelessness. The diakonia began with Jesus in a time of great social need and although it was ‘disappeared’ by the Church by the seventh century, it reappeared in times of deep social turmoil (e.g. the dark ages, the Second World War), and sometimes existed in forms outside the church. We have entered a new time where the multitude of needs created by our social systems requires diversity in skills and experiences, backgrounds and education. Diaconal Ministry (instituted in the 1980s) may seem to be a relatively new addition to the UCC; in reality, the diakonia (a ministry of service) has been around since the beginning of the early church. This model of ministry was embraced in different forms by all denominations, with the diakonia holding different positions/titles/authority at different times. The concept of the diakonia was first personified by Jesus in his act of ‘self-emptying of power’ when he washed the feet of the disciples (John 13:1-5). Jesus portrayed a ministry of walking with others; not one of power over, but of ‘power with’ others – a ministry of empowerment. Jesus was a social activist working in the world, not enclosed by a building. He modelled a ministry of inclusivity, of raising up all people, of highlighting gifts and talents, and of leaders and learners walking together as equals. While many diaconal ministers in the UCC wind up in solo positions in congregations, a few, like myself, choose to work on the edge of the church. We have been called to a different kind of ministry. Tremendous energy is required to stay true to our own calling in a setting that limits possibilities and blocks potential for new forms of ministry, particularly now because team ministries are rare and the UCC has barely begun to explore Presbytery-supported ministries outside the church. I am a self-proclaimed ‘diaconal’ artist. I create healing, justice oriented, and spiritually based art work for use in churches and community. I bring my artwork into the worship experience, offer presentations on social justice issues, and assist with Palliative Care Training. Although I remain non-commissioned, I am a member of the Diakonia of the United Church of Canada (DUCC). DUCC membership is open to anyone associated with the United Church of Canada who considers their ministry to be diaconal. An important part of the diaconal education process at the Centre for Christian Studies is the development of a strong diaconal identity. Diaconal Ministry is more than a set of functions or a style of ministry. It is a cultural identity of community and outreach that is grounded in historical and biblical experiences. An ability to conceptualize and contextualize our work in diaconal terms is fundamental to diaconal ministry. It is a particular way of looking at the world — a perspective that tends to come from the underside of society. A solid grounding in the diakonia strengthens the authenticity of our work in ministry. Combining my diaconal education and my artistic training brings theological concepts more fully alive and makes them profoundly meaningful for me and for the people with whom I engage. One passage that provides food for thought as we consider the One Order model is the parable from Jesus (Luke 21:25-31, NIV): “Look at the fig tree and all the trees. 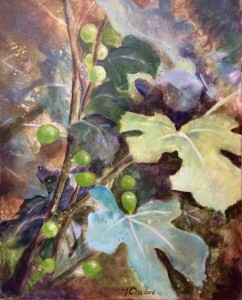 When they sprout leaves, you can see for yourselves and know that summer is near… you know that the kingdom of God is near.” The fig tree, an ancient symbol in the Hebrew text and an important one in the Christian scriptures, provides an opportunity to reflect theologically on the cycle of death and loss countered by abundance and plenty. The diversity and longevity inherent in the fig tree — its apparent death and rebirth, its cycle of first birthing new figs and then unfurling new leaves — is reflected in the work we are doing here as we struggle to understand the diversity of our individual ministries in this evolving structure that we call Church. I am thankful that this discussion has gone to Remit. This forced opportunity opens the door to a thorough exploration of the One Order of Ministry document by the body of the church. I am also encouraged by the current discussion on education for preparation for ministry in the UCC, one that embraces a wider competency-based educational program similar to the Centre for Christian Studies and the Sandy-Saulteaux Centre. While the focus of each of ordained ministry, diaconal ministry and designated lay ministry has similarities, there are significant differences in our approaches and our understandings of self in ministry. I would encourage studies that explore and explain the differences so that none are threatened or downplayed or discouraged in their work, and that each will learn to define their own identity with clarity and transparency.